You are here: Home / Health & Fitness / Was It Gout, Pseudogout…My High Heels? 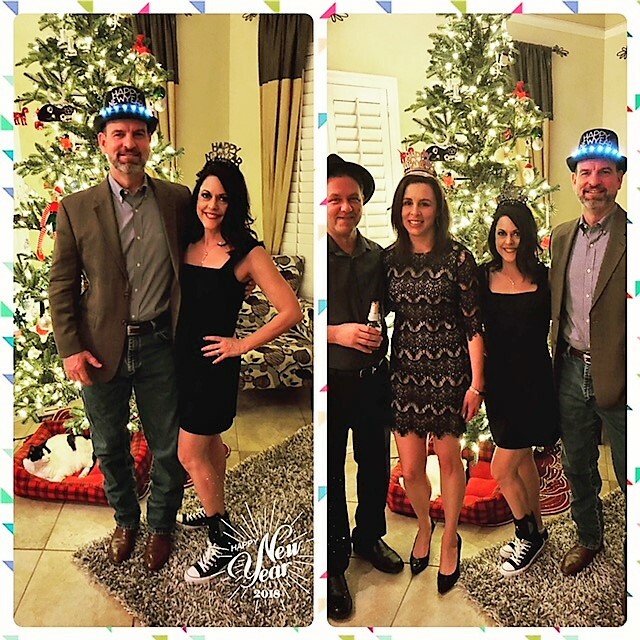 Manic: Waking up on my hub’s birthday last December 9th with an unexplained, incredibly painful and swollen ankle that I could bear no weight on! I was perplexed and in extreme pain. I had not injured it and had gone to bed as usual the night before. It was so strange! Managed: After weeks of doctor’s appointments, two emergency room visits, medical tests, meds and more, I don’t have a solid answer, but I have a tale to tell with some lessons learned to pass on to my readers when it comes to foot, ankle and really overall health. Back to December 9th now. The pain. Wow! I told my husband and the ER doc that the extreme discomfort was an 8 on the pain scale and reminded me of laboring with my son…who was 9lbs! The physician told me that typically he would call my swollen ankle/extreme pain gout, but that I was missing the classic burning redness that accompanies a gout affected joint. For most, gout happens in the big toe, but some can experience this ailment in an ankle or elbow. Gout was pretty much eliminated, but the X-ray showed a lot of swelling with no fractures of any sort, so I was put on steroids to reduce the swelling. I was also given pain meds. I tend to be somewhat homeopathic, so I try to avoid pills, but not this time. The pain was bad, so painkillers were my friend as I got through this. Three days later after the initial December 9th attack (as I call it), I was back on my feet and back to my busy life. I was running around quite a bit, but I was wearing tennis shoes and not high heels. I still had a slight limp as I ran around town. Unfortunately, I returned to my busy bee self too soon. Later that evening, and with hubs now out of town on a business trip, I laid in bed literally watching my ankle swell, yet again. This time it was moderately bruised by morning and the extreme pain had returned. One careful bath filled with anti-swelling Epsom salt and one pain pill later, I again could bear no weight on my foot. I was so frustrated that I was having a second attack. Thankfully, my son had just finished his college finals and was able to come over and drive me to the emergency room. Once again, a different doctor didn’t think my ankle presented enough of the symptoms to be called gout. He was equally perplexed. Later in the ER waiting room, my ankle continued to mysteriously swell! After receiving normal bloodwork, to my relief, I was sent home to wait on the MRI results. 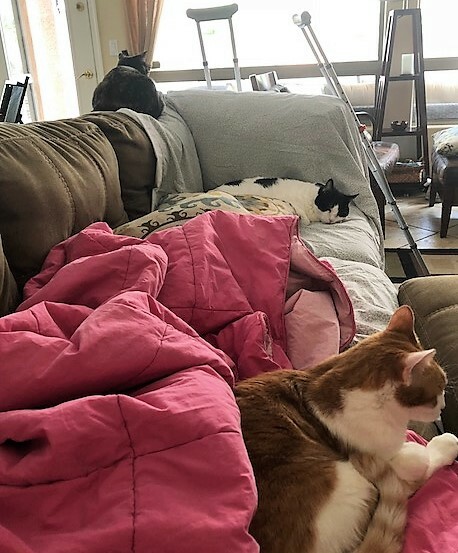 Back to couch rest, but at least I had furry friends to keep me company! The MRI showed a lot of swelling (this I knew) and listed a potential arthritis gout like condition but no definitive diagnosis. The next step was to have fluid drained from my ankle by my podiatrist. Kudos to Dr. Jon Beecroft with Ahwatukee Foot & Ankle, who took excellent care of me through this ordeal staying in touch with me every step of the way as we worked to figure out my mystery diagnosis. I have blogged about his excellent care before when I battled and overcame my plantar fasciitis. Dr. Beecroft was very gentle as he administered a numbing shot to my ankle, withdrew fluid for testing and inserted a steroid shot. I experienced very little discomfort and was also in good shape due to my caring mother-in-law, who came to town and held my hand during this procedure. She is also a nurse and taught nursing at NMSU, so I was in good hands both with her and with my trusted podiatrist. My regular doctor at Caring For Families was also excellent, too. I am a lucky girl for sure to have terrific physicians and family! Dr. Beecroft did a nice job gently doing the extraction and the steroid shot with my ankle. Unfortunately, only a little fluid could be extracted, so it was not enough to get a confirmed gout diagnosis. However, other conditions like Valley fever were ruled out. So, the mystery continued. I stayed on crutches for a few weeks and rested a lot. Keeping my foot elevated was key. By my follow up appointment with my podiatrist, I was back on my feet and taking things slow. I wore an ankle brace for support and only wore tennis shoes. As Dr. Beecroft went over all my normal test results, we were both pleased but still puzzled. He mentioned pseudogout. Because I never experienced some of the more classic gout symptoms, this other type of gout, psuedogout was something to consider in my case. A big cause of pseudogout can be dehydration. When excess calcium is deposited into the joints, it can create the very painful irritation, like what I experienced. Perhaps we had an answer now! 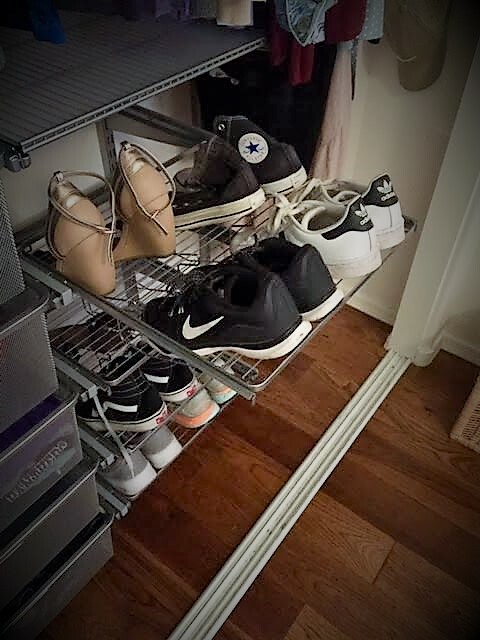 The heels on this rack are now outnumbered by tennis shoes, my new best foot friend. I realized that without a definitive diagnosis, I needed to acknowledge that I was dealing with some sort of inflammation and what, if anything, could I do about this. I didn’t have to think long and hard to discover the answers. Less wine. Better nutrition. More consistent gym workouts. Less sugar. More whole foods. And no more high heels! Getting a good night’s rest is also helpful. Leading up to my attacks, I was drinking a lot of wine, about 2 to 2 1/2 glasses five days a week. The cumulative effect of that can add up. Too much wine and coffee (my two favorite go to beverages as I avoid all other sugary drinks). Not enough water and too much coffee and booze can lead to dehydration, something my doctor says can greatly contribute to a condition like pseudogout. Better nutrition. I was dining out a lot. During the weeks leading up to my affected ankle, my daughter did not yet have her driver’s license. She was cast into a lead role in a paid theatre production, so this wonderful accomplishment became our main priority. With almost nightly rehearsals, I waited for her at nearby restaurants, meeting with pals to eat high fat restaurant food, drink wine and parade around in my cute high heels. Soon my daughter was a newly licensed driver, so ordering that second glass of wine, almost nightly, was too easy to do since I now had a designated driver! I also had let my workouts wane due to our busy schedule. Exercising with strength training is very important to keep up with as we age. And a big culprit, I now think was my beloved high heels! At a holiday event with my girl and the high heels I was wearing have zero ankle support. I was wearing them a lot at my restaurant meet-ups. Several years earlier, I had injured my ankle and my podiatrist tells me that I could have an old sprain that never healed 100%. 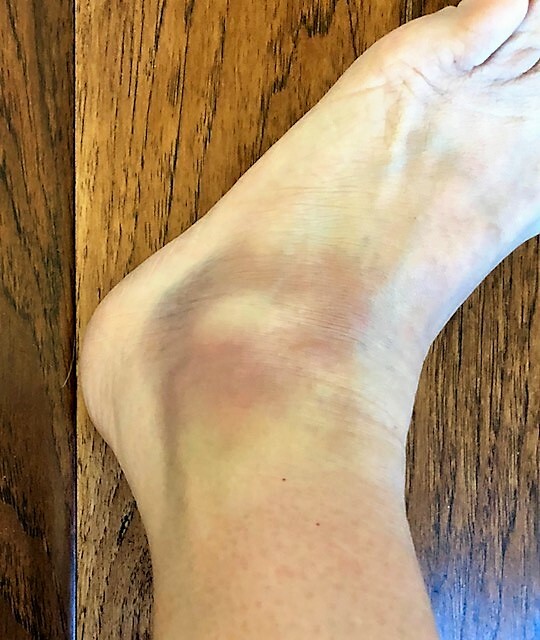 Running around in heels so much of the time could have aggravated the old sprain and resulted in the swelling that resulted in the bruising. But again, this diagnosis can’t be proved. So, it may have been gout or pseudogout. Or a prior injury/sprain that was kept from completely ever healing by continued high heel wear and tear on my foot. And just in case it was gout, I now eat very little red meat, no shellfish, no beer and less wine, as I mentioned. These foods can contribute to a gout attack. After switching my footwear to mostly flats and tennis shoes, my longtime massage therapist couldn’t get over how much looser my hips are and how much less pain I experience in my glutes during our sessions. He asked me what I was doing differently. When I thought for a minute and told him that I no longer wear high heels, he exclaimed that was it. He then told me that heels do us ladies absolutely no favors and cause long term damage and pain as we progress in age. My mother has warned me about my beloved heels for years. Yes, Mom knows best. So I have only worn heels twice since December 9th, both at work. I now regularly wear stylish flats, Chucks Converse and tennis shoes most of the time. I did recently treat myself to a pair of Tory Burch flip flops and I now believe the hype about why they are worth the price. I do feel like my feet get more support with the Tory shoes due to the wide embracing top of the shoe. Although I don’t think flip flops are good for our feet and ankles. I have wanted to blog about this for a while, but I put it off since we never could get a definitive diagnosis. I finally decided to share my story to encourage all of you ladies out there to wear your heels with caution, wear them less and find styles that are supportive and not as damaging. …and yes, wear those high heels less, ladies! They take their toll as we age. By New Year’s Eve, I was finally 100% back on my feet, but I wore a brace (and yep, Chucks tennis shoes with my dress!). I wore the comfy and supportive soft brace that my podiatrist gave me for a few more weeks until my ankle was finally back to normal. I have been cautiously optimistic that I don’t have another attack. I continue to practice my healthier habits and only wear high heels on special occasions. I choose heels that have support as well. And with that, I am going to step into my tennis shoes and jump into my day…carefully jump…with my potentially gout, pseudogout or high heel abused ankle. We will never know the real answer, but I move ahead doing all that I can to keep potential inflammation at bay. It was bizarre, my ankles looked like those of an 85 year old! I was referred to a Dr Gear, long story short it was a result of whiplash from a car accident from 1985! There was a pinched nerve in my spine that regulates kidney function. He put me on this strange table that straps you in and pulls you apart. Then he dropped the part of the table that supported my lower half and I heard the spine cracking! It was scary! Later that night, ankles were back to normal and it’s never happened again! Wild! Not sure if Dr Gear is still around (his office was near 16th street and I 10) but his methods worked wonders! That is crazy! I am so glad you have been OK ever since! If I have a reoccurance, then I may look your doc up. Thank you so much for leaving a comment! Here is to healthy days ahead for all!